I have begun a new piece. It is three days young. Starting as a simple, non-challenging project – one designed to take me from A to B (with A being Mallorca and B England), a sad parting attached to a reluctant returning – it has quickly evolved, presenting me with a list of demands: a cashmere circumference, merino eyes, a mohair tongue and snowflakes of mixed synthetic origin in an array of colours: coal, chalk, slate, berry, pearl and ice… I expect glass beads and metalic sequins to follow, as well as lace edging in a yet-to-be-determined yarn. Promising to be many-layered and complex, it should help to keep me occupied for a while. And while I cannot speak for the length of that illusive allotment of time, that intangible allocation of clock and calendar digits, I can at least relax in the knowledge that it will be long enough for me to start to settle and adjust. It’s a brave new world out there (big, loud and scary) and I am a timid old thing (small, quiet and soft), it could take some practice. In times of upheaval, being busy is important, distracting us from what we cannot cope with or do not wish to see, acting (if you like) as the ideal wall of defence against externals that could otherwise turn around and bite. Fearing change and needing routine, this (the necessary employment) is especially true for me. Think of it as a holding agent – a boat to cling to or ride within whilst navigating a vast and choppy sea roughly the size and temperament of the Atlantic. 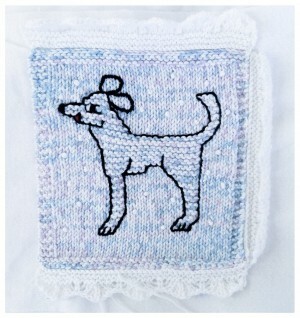 I need my dishcloth mutt: today, tomorrow and next week. Since arriving (four days ago for me writing, longer for those of you reading this), words have deserted me and what I have managed is painful, taking ages in gestation and demanding much in labour to be set down. I’m also unable to read, my mind resisting the page like two opposing magnets. Television works better, although only intermittently depending on what I’m trying to watch. Having been away for three years and not having watched anything at all for two of those, I am out of touch. It was the same yesterday when I went into town (and here, I mean Windsor not London: diddy rather than hulking, slow rather than fast, outskirts rather than central). The world appears to have grown in my absence, leaping forward several decades in the course of several years, so that – walking into a bank, navigating the likes of Superdrug or Boots, attempting to connect to WiFi in a café or pub – I have no idea what to do or where to start. Even the bank has changed. What happened to the cashiers? Like Scarlet Johansen in Lost in Translation, I am totally confused. And the confusion is like a weight bearing down on me, crushing my ability to navigate. I’m trying to stay positive and strong, placating my inner brat with all of the things it likes: hot drinks in take away cups, people-filled venues, central heating and warm clothes, quiet time, creative time, cuddles and company, upbeat music, light and fresh air, exercise, routine, sewing and yarn, plans, projects, ideas and dreams, romantic notions I choose to believe in, life after the brief diversion of here… And while it might not be the solution I am seeking or anywhere near a cure to my current malaise, it’s a start to somewhere and something and that’s good enough for now. This entry was posted in conversational (aka, writing the monster out of my head), pen & ink, yarn & thread and tagged art, art therapy, Atherton, beads, beginnings, blog, conclusion, conversation, departure, dishcloth, dishcloth dog, dog, end, ending, exit, expat, farewells, fortune, future, goodbyes, grounding, guidance, heart, hobbo, hobo, home, home is where the heart is, journal, Knitting, love, meditation, mettalic thread, oracle, Rebecca, relocating, relocation, sequins, sewing, soul searching, the end, the littlest hobbo, therapy, thread, writing therapy, yarn therapy. Bookmark the permalink.